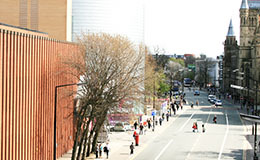 Find out where a degree from the School of Computer Science at The University of Manchester can take you. In my role, I am exposed to a very diverse range of technologies, allowing me to get a deeper understanding of how a particular technology works and how it’s integrated with other systems. It is very satisfying knowing that the projects that I manage will ultimately deliver business improvements. Current position: Software Engineer, BBC Future Media. The podcast episode below features interviews from our 2016 UG Graduation, which included a formal ceremony followed by a Champagne reception celebration in the Kilburn Building. There were over 400 people in the glorious Manchester sunshine toasting our successful graduates, including many families and friends alongside academics and support staff from the School. We interviewed a few of our students (who are, in order by appearance: George Vanbrugh, Lora Lovchalieva, Veneta Haralampieva & Anmol Khurana) and asked them about their experiences as an undergraduate here in Manchester and where they plan to go next, now they have graduated. We also speak to Toby Howard, our Undergraduate director, on a proud day for everyone in the School, where we get to celebrate the fantastic achievements of so many students, as their journey at Manchester comes to an end. Class of 1983 - Where are they now? Seven of the CS and Maths class of 1983 visited the School on Saturday 22nd August 2015. They toured the Kilburn and Alan Turing Buildings, but the highlight of the tour for them was sitting once more in the seats they routinely occupied in LT1.1! The visitors were Karen MacDonald, John Douglass, Zenon Chomyszyn, Andrew Moss, John Vickers, Iain King and Garry Pascoe. Since leaving Manchester University with a Joint Honours degree in Computer Science and Mathematics, Karen McDonald went to work for a software development company, Logica, in their Rotterdam offices for 2 years. She worked as a programmer on a gas pipeline control and simulation system and a project for Shell in Rijswijk amongst others. Later, as part of a world tour, she took a contract in Sydney for the Australian Coal Industry Research Laboratory as a real-time programmer. On her return to the UK, she worked as a software engineer for a small cutting-edge company in the control engineering field, specifying a simulation package for aircraft control and later, on quality assurance. Now living in Luxembourg, having taken a break to bring up a family, she is now working in the area of her other love, music. Class of 1973 - Where are they now? Following graduation the majority, but not all, of this group that graduated in Computer Science in 1973 found jobs in the budding computer industry. They mostly worked for large manufacturers or software houses, writing software and supporting customers. Then as now, Manchester computer graduates were highly sought after. A practical grounding, together with the broad educational background from our course, soon led a number of them to branch out and develop their careers. Read more in the full article written by our alumni.